Centipedegrass, often spelled centipede grass, is a warm season grass popular along the southern coastal regions of the U.S. Some of my site's visitors report growing this grass variety as far north as North Carolina. However, this may be stretching the limits of its range since it is subject to winter damage, especially in snowy areas. In the U.S., centipede grass grows best in the southern Warm/Humid Adaptation Zone. It also does well in countries with similar climates. The grass is generally light green with a coarse texture. Centipede grass spreads by stolons, which are above ground stems that many people refer to as "runners". Every couple inches along the stolon is a "node" that sprouts new grass blades on top and roots on the bottom. In this way the grass thickens and spreads. For more information on how plants grow, see our page on Plant Structure. It is sometimes called "The Lazy Man's Grass" but is somewhat of a misnomer. The name comes from the fact that it needs less fertilization, and therefore less maintenance that other grasses. While it may be the perfect grass for some people, it is not for everyone. If you are a "hands-on" type of person and love to work in your lawn, then you may not find this quite to your liking. It depends on your needs, your soil type, and conditions it is planted in. Centipede grass is similar in appearance to St. Augustine grass. Lower nitrogen needs compared to some other grasses. Grows slowly, so it needs to be mowed less often. Can grow in low nutrient soils. Does not hold up under medium or heavy traffic. Over-fertilizing can harm the grass. Too slow growing for some people. Allowing it to grow too high can harm the grass. Cold weather can injure the grass. Prefers certain soil conditions described below. Seed is quite expensive as much as $40.00 a pound or more for some varieties. Centipede grass is a low maintenance grass, in part because it grows more slowly than a lot of other grasses. The slow growth rate means less mowing and is quite appealing to some people. Centipede grass needs only 2 lbs nitrogen per 1000 sq. ft. per year. The low nutrient requirement means it will perform better in less fertile soils than many other grass types. The photo above was contributed by Alexander Crump. The amazing part is that Alex lived in Petersburg, VA at the time. That is the equivalent of growing centipede grass is southern Illinois or the middle of Missouri, which is generally considered too far north. I am constantly amazed how people are successfully pushing the northern range of this grass. Cold tolerant varieties are helping to grow centipede grass where it never grew before. Centipede grass spreads by production of runners called stolons. They will spread onto patios, sidewalks and the like, but can easily be trimmed back. These stolons can also be cut and lightly covered with soil where they will sprout and grow. You can purchase centipede grass as sod, plugs, and seed. 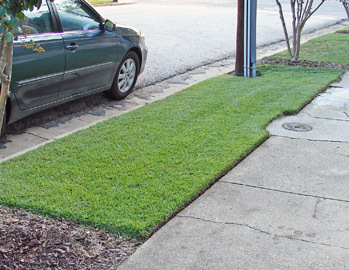 If you need an instant yard, choose sod. Because of its runners, it can become a problem if not maintained. For example, it can easily spread into a neighbors lawn. The good thing is that since the grass only produces stolons (above ground runners) as opposed to rhizomes (below ground stems) the runners can be trimmed back and kept under control. The photo (Contributed by Alexander Crump) shows how well centipede grass can be maintained. Again, the stolons are more easily maintained since they grow above ground. Thanks again to Alex for allowing me to show a portion of his beautiful lawn. Well done, Alex. Centipede grass is considered a southern grass. It tends to thrive in hot, humid climates. However, in recent years these boundaries are being pushed farther north. It is the dormant season that inflicts the heaviest toll on this grass. In areas with cold winter temps and significant snow, the grass may not recover well the following year. Newer varieties with better cold tolerances are providing people with the ability to grow this grass in places that would have certainly killed some older varieties. Centipede cannot tolerate a whole lot of activity. I have received emails from readers telling me how their riding mower tires damaged the lawn. The tires left behind light brown trails that showed up later. Fortunately, I don't think it is the norm. Aside from heavy use, it can't take compacted soils, alkaline soils, extreme drought, or heavy shade. In addition, the soil must be balanced in phosphorus and potassium. It is classified as a drought tolerant grass, but this label comes with its own problems. Many people believe that a drought resistant grass means it doesn’t need to be watered, or at least, very infrequently. That is not true. It will still need to be watered or it could suffer damage during high heat or drought periods. Centipede grass prefers acidic soils. The grass will suffer in high pH soils. Alkaline soils tend to block iron and the grass will appear yellow. Adding sulfur will slowly lower the pH. Applications of certain types of lime can damage the grass. If lime is needed be sure to apply light applications of agricultural limestone. Centipede grass doesn’t quite go dormant like bermudagrass or zoysiagrass. Frequent up and down weather patterns in winter can send the grass into shock. It can be severely injured in extended periods below 20 degrees. Some of the improved varieties have a much better cold tolerance. Centipede grass is shallow rooted and will need to be watered if drought conditions are forecasted. As with other grasses, the grass will tell you when it needs to be watered. A sign that grass needs watering is evidenced in a slight change of color. Another sign of drought stress is when your footprints remain in the grass after walking on it. When walking on well watered grass, the grass should immediately spring back up. Water should be applied to the point where the soil is wet 3 to 4 inches deep. Deep watering promotes deeper root growth. Centipede grass doesn’t go dormant like other grasses, so it will need to be watered occasionally in the winter months, especially during warm periods. Don’t practice shallow watering, this only promotes even shallower rooting. Soil dries out from the surface down, so grass with shallow roots will show stress much faster than deep rooted grass. Depending on the type of soil you have will help determine how often per week you will need to water. Sandy soil doesn’t hold water well, so you may need to water two or three times a week. Loamy or Clay soils hold more water. Clay soils can compact easily and compacted soil has less air and holds less water. Don’t set your sprinkler system to come on everyday, but rather water when it needs it. Those who water everyday whether the grass needs it or not will only encourage thatch or disease problems. Centipede grass should be mowed at 1 to 1.5 inches and should not be allowed to grow above 2 inches. Grass quality deteriorates when the grass is allowed to get too long. It can be allowed to grow to two inches tall in late fall just before the first heavy frost. When mowing, a sharp blade is necessary for a clean cut. Dull blades will tear the grass instead of cutting it. Centipedegrass, like other warm season grasses, will produce thatch. Thatch is not soil, but a mixture of shed roots, stems and other lawn debris. Contrary to what you hear, lawn clippings do not contribute to thatch. Thatch is acidic, so you will have more problems in high acid soils. Over fertilization and excessive watering will also encourage thatch build up. In addition, allowing centipede grass to grow beyond 2 inches tall will encourage thatch. Thatch can be harmful in many ways. Thick thatch forms a barrier between the grass and the soil below. The grass roots can’t tell the difference between thatch and soil, so new roots will often grow in the thatch. Thatch is a spongy organic material and dries out much faster than soil. If it completely dries out, it can sometimes become hydrophobic. This means water will not penetrate, but instead, will pool on the surface of the thatch. Fertilizers, pesticides, and herbicides often become trapped in the thatch, never reaching the soil. Tests have shown that almost 100% of insecticides become trapped in heavy thatch. This can also prevent the insecticides from controlling the target insects. There are also other things you can do to prevent or alleviate thatch problems. One is to run a core aerator over the grass. Make sure it is a core aerator and not a spike aerator. Spike aerators will not relieve soil compaction. Core aeration opens up the soil by pulling out a 2.5 to 3 inch plug allowing water and air to reach the root zone. Rent the heaviest core aerator you can find. Grass, thick thatch, and root systems can be hard to penetrate and will need a heavy machine to do the job effectively. These machines are heavy and difficult to handle if you are not used to them. You may consider hiring a professional to do the job for you. When you are finished, leave the cores on the soil to break down naturally. As the cores break down, they feed the soil micro-organisms. Top dressing is a practice of professional turf organizations and can be done on home lawns as well. It is the process of scattering organic matter over the surface of the soil. A thin layer of quality organic matter will help feed the beneficial micro-organisms that feed on the thatch. If needed, vertical mowing or dethatching machines can be rented to tear out the thatch. A blade spacing of 3 or 4 inch will work. Less than 2 inches may harm the grass. Centipede grass should be fertilized twice a year, but can get by on one. You should not apply more than 2 lbs of nitrogen per 1000 sq. ft. per year and the nitrogen divided up into 2 feeding per year. Do not apply more than 2 lbs nitrogen per year or the grass may be harmed. Note: The 2 lbs per year rate is really for those who are trying to get the most from their grass. A rate of 1 to 1.5 lbs per year will work well most people. The grass should be fertilized once in the spring after green up and another in mid-summer. Centipede grass will do well with slow release organic fertilizer. Many organic fertilizers are low in macro-nutrients (N-P-K), so you don't have to worry much about over fertilization. Centipede grass prefers somewhat acidic soils. Soils with a pH over 7.0 can cause the grass to become chlorotic (iron deficient). Yellow grass blades are a symptom of an iron deficiency. A temporary solution to the deficiency is an application of iron. Iron chelates or iron sulfate will provide green color for a short time. Don’t use the granular iron for this situation, but iron that is mixed with water and sprayed on. This way, the iron is absorbed directly into the plant and not taken up by the roots. Why? Once the iron touches the soil and starts to break down, it converts to the type that cannot be taken up by plants due to the pH problem. Correcting the soil pH problems is the long term solution. Applications of sulfur as determined by a soil test will help with lowering the alkalinity. 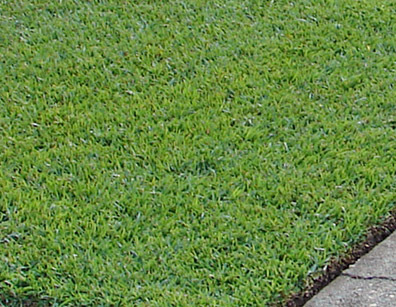 Centipede grass can be purchased in sod, plugs, or seed. Sod provides an instant yard. Plugs are the second best method and should be spaced 1 ft. apart. Sprigs, which are actually stolons, should be shallowly covered with soil to encourage rooting. The blades need to be left uncovered and exposed to direct sunlight to perform photosynthesis. Click here for a helpful and detailed view of Photosynthesis. Weeds may be a problem until the grass fills in which could take all summer. When planting centipedegrass, remember that it grows slowly the first year or two. It may take several years to fill in. This following tip was submitted by "Ben", an LCA visitor from Georgia. Ben grew up with centipedegrass (in North Carolina!) and found the old saying to be true: 1st year it sleeps, 2nd year it creeps, 3rd year it leaps. This is a good rule of thumb to consider. Centipede grass seed is quite small and is hard to spread evenly. One of the tricks of the trade is to mix the seed with sand. Up to 1/2 half pound of seed to a gallon of sand over a 1000 sq. ft. It may take up to 21 days to germinate. Keep the seed bed moist until the seeds have sprouted. A starter fertilizer of less than 1 lb of nitrogen per 1000 sq. ft. can be applied. Starter fertilizer should only be used with seed and should never be used on established centipede grass. Lime is essential for a balanced soil pH. However, be careful about what type of lime you apply. Centipede grass can be damaged with large amounts of lime. Agricultural limestone is best to use. You can also use Super-Cal Liquid Calcium when lime (calcium) is needed. Super-Cal will not burn grass tissue. 2,4-D herbicide shouldn’t be used on centipede grass. Be sure to check the label of many popular broadleaf herbicides for the 2, 4-D ingredient. Click on the link for information on weeds and weed control. You will find valuable weed information, including photos for correct identification and the steps necessary to control them. Centipede grass isn’t bothered too much by insects. If it is attacked, grub worms will probably be the most damaging. It can also be bothered by the spittlebug and mole cricket. Nematodes are another major pest. Nematodes are microscopic worm like organisms that live in the root zone. However detection can only be done at a lab that specializes in turf problems. Your local university extension office may send in samples to be checked for a small charge. If your grass is thinning and dying and you cannot figure it out, it be nematodes. White grubs are the larva of June beetles. White grubs chew through the roots just below the soil surface. Large sections of the lawn can be damaged. To check for grubs, cut three side of a one foot square and peel back the grass to expose the grass roots. Grubs will live in the root area of grass. More than three grubs per sq. ft. warrant the use of insecticides. A good biological control for grubs, sod webworms and cut worms is the microbial insecticide called "Baccilus Thuringensis". This is a safe insecticide that only targets certain insects. Mach 2 is another biological control that uses Halofenozide as the active ingredient. It targets immature grubs without harming desirable insects. This product needs to be applied well in advance of any damage. It will have no effect if applied at the time insects are damaging your lawn. If you have had problems with grubs before, you will probably have them again. It means you have the type of soil the adult June beetle is looking for to lay eggs in. Quick kill products for most insects include trichlorofon (dylox) and carbaryl (sevin). Be aware that thatch can hinder the movement of insecticides to the root zone where grubs live. Some pest controls, including some biological controls, are available only to certified pesticide applicators. Many commercial applicators will apply what you need without selling you a whole program. Check with those in your area to see. Brown patch occurs in the hot, humid, wet periods of summer. It begins as a 1 foot wide patch and can enlarge to several feet. The lesions that appear on the grass become tan in appearance as the grass tissue dries out. Webby mycelium often appears on the grass on damp mornings. Do not fertilize when this disease is present. It will feed the pathogens and make it worse. As the humidity decreases and the soil dries out, the disease subsides, and the grass usually recovers. As long as the grass crown is not affected, the grass will grow out of it. If you live in a section of the country where high humidity is the rule and not the exception, fungicides, such as Daconil, are available to help control brown patch. Fungicides must be applied in the early stages of disease development for best results. For organic fungicide treatment, use Actinovate. Actinovate is a certified organic and uses a patented bacterium that will suppress Rhizoctonia, the pathogen species that causes brown patch. The disease pathogen is not identified, but the declining grass seems to be more prevalent in over fertilized, high growing turf. Following sound maintenance practices is the best approach to avoiding this disease. Bermudagrass is the most commonly used warm season grass in the U.S. Click here to see why it is so popular and tips on how to care for it properly. The popularity of organic lawn care is increasing. click here for complete and unbiased information on how organics work, types of organics for home use and the different approaches to organic lawn care. Lawn fertilization is one of the most important aspects of lawn care. However, it is also one of the most misunderstood. This page is your gateway to understanding lawn fertilizer and soil fertility.